The Everbilt 1-3/8 in. Platinum Closet Pole Sockets (2-Pack) help you install a closet pole all the way to the wall. The set includes 1 open-lip and 1 closed-lip socket, making it possible to install the sockets before inserting a closet pole. 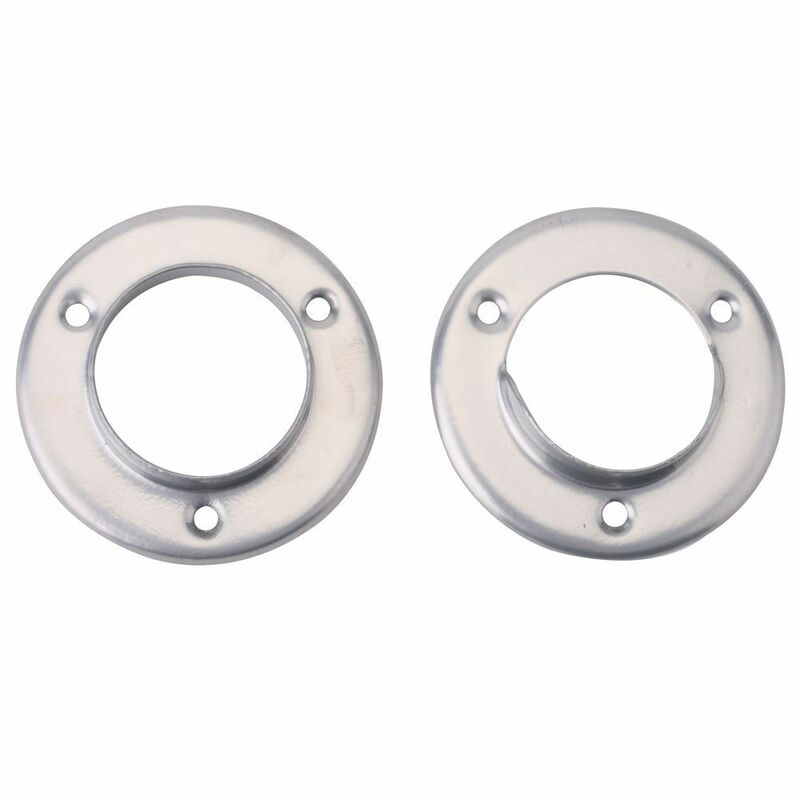 These are ideal to use with closet poles up to 1-3/8 in diameter. The sockets have a durable platinum powder-coat finish. Mounting screws are included. The Everbilt 1-5/16 in. Chrome Heavy-Duty Brushed Nickel Closet Pole End Caps are a simple and durable solution for the exposed ends of your closet pole. Constructed from solid cast zinc, the caps are coated with a chrome plated finish that complements your closet design. The included hidden set screws secure the end caps in place on the pole, helping you prevent hangers from sliding off the pole ends. The caps are designed for use with 1-5/16 in. closet poles. The Everbilt 1-5/16 in. White Heavy-Duty Brushed Nickel Closet Pole End Caps are a simple and durable solution for the exposed ends of your closet pole. Constructed from solid cast zinc, the caps are coated with a white plated finish that complements your closet design. The included hidden set screws secure the end caps in place on the pole, helping you prevent hangers from sliding off the pole ends. The caps are designed for use with 1-5/16 in. closet poles. Made of industrial grade steel and polished to a high gloss chrome plated finish. Offers best holding power without sagging. Proper installation calls for a bracket installed every 48 Inch maximum. Can be cut to size by hand or machine. The Everbilt 48 in. - 72 in. White Heavy Duty Adjustable Closet Rod requires no detailed measuring or difficult cutting for installation, making a quick and easy solution for your home closet. The durable steel rod adjusts from 48 in. to 72 in. to fit your unique closet size. Built-in plastic wall attachments and mounting hardware are included for convenient installation. 1 3/8-inch Closet Pole Socket in Platinum Steel (2-Pack) The Everbilt 1-3/8 in. Platinum Closet Pole Sockets (2-Pack) help you install a closet pole all the way to the wall. The set includes 1 open-lip and 1 closed-lip socket, making it possible to install the sockets before inserting a closet pole. These are ideal to use with closet poles up to 1-3/8 in diameter. The sockets have a durable platinum powder-coat finish. Mounting screws are included.